The Yankees were back after a one-year hiatus, having won thirteen (13) of their last fourteen (14) Series games and twenty-eight (28) of their last thirty-one (31). This was the first Subway Series between the Brooklyn Dodgers and New York Yankees, who had already faced the crosstown New York Giants five times, and the Series was now 1–0 in favor of the Bronx Bombers. These two teams would meet a total of seven (7) times from 1941–1956—the Dodgers' only victory coming in 1955. After a short, one-year absence, the perennial champion New York Yankees returned to the familiar territory of post-season baseball in 1941. Despite losing the American League pennant to the Detroit Tigers the year before, the "Bronx Bombers" were still favored after winning thirteen of their last fourteen Series games and twenty-eight of their last thirty-one games in baseball's premier event. Joe McCarthy's franchise however, entered the post-season with heavy hearts after Yankee icon Lou Gehrig passed away on June 2 in Riverdale, New York. The "Iron Horse" had finally succumbed to a relatively unknown affliction known as amyotrophic lateral sclerosis which has since been renamed Lou Gehrig's Disease. Despite their emotional scars, the power-laden Yanks had managed another one of their dominant pennant runs, winning the American League title by seventeen games. Their cross-town and "cross-league" rivals, the Brooklyn Dodgers were determined to keep the World Championship title in National League hands and were dependant on solid pitching to keep the Yankees' sluggers in hold. The Dodger's rotation certainly had their work cut out for them as Joe DiMaggio, Charlie Keller and Tommy Henrich all hit at least thirty homers in 1941, and Joe Gordon slammed twenty-four. Nothing changed in the Series opener as the "Bronx Bombers" continued to get the job done. Gordon remained a standout as he homered and knocked in two runs for a 3-2 victory that featured a Red Ruffing six-hitter. After losing to the Dodger's Whitlow Wyatt 3-2 in Game 2, the Yankees got a break and reclaimed the Series lead. Brooklyn's Freddie Fitzsimmons was locked in a 0-0 stalemate with Marius Russo in Game 3 when, with two out in the seventh, the Yankees pitcher fired a line drive that caught Fitzsimmons square on the knee. While shortstop Pee Wee Reese caught the deflected ball to end the inning, Fitzsimmons was obviously through for the day. Hugh Casey came in as relief but was nailed for four hits and two runs in the eighth. His teammates were only able to get only four hits off Russo and eventually lost 2-1. Despite trailing two games to one, Brooklyn's pitching rotation was doing their share while holding the Yankees' sluggers to less than stellar stats. Through the first four games of the Fall Classic, the "Bombers" had managed a single home run off the Dodgers and in their thirty-four innings of Series at-bats preceding the fateful ninth of Game 4, the Yanks had scored only ten runs. Things seemed to be headed in the Dodgers' favor with a 4-3 lead and two out in the ninth (with no Yankees on base) when an error of catastrophic proportions turned the momentum of the game and inevitably, the Series. As a probable third strike on Henrich crossed the plate, it was mishandled by the Dodger's catcher Mickey Owen. 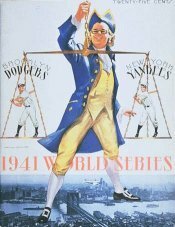 Instead of sealing the Series tying victory, the error kept the Yankees alive resulting in a four run rally that snatched the sweet taste of victory from the mouths of Brooklyn and left them with the bitter taste of a 7-4 defeat. The frenzied Ebbets Field crowd (who was poised for celebration) suddenly stood in disbelief as they watched their team implode. First, Henrich stole first on the Owen error. Then DiMaggio followed with a single, and Charlie Keller shot the Yankees ahead with a two-run double. After a walk to Bill Dickey, Gordon further quieted the Dodgers faithful with another two-run double. The Yankees' Johnny Murphy then turned in his second consecutive inning of 1-2-3 relief, and New York had handed Brooklyn a devastating defeat. Owen said after the game, "Sure, it was my fault. The ball was a low curve that broke down. It hit the edge of my glove and glanced off, but I should have had him out anyway. But who ever said those Yanks were such great sluggers? They're the real bums in this Series, with that great reputation of theirs." It mattered little as the Yankees finished them off the following day when Ernie "Tiny" Bonham put the Dodgers out of their misery, tossing a four-hitter in Game 5. Henrich (who had dodged a bullet in his previous outing) homered in the Yankees' Series-clinching 3-1 triumph. 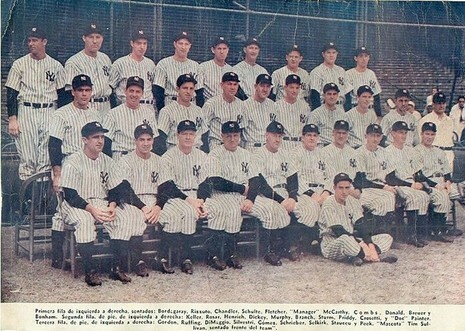 Despite winning their ninth title, the "Bronx Bombers" had certainly failed to live up to their nickname at the plate. Surprisingly, the World Champions had managed only two home runs and averaged a mediocre .247 in the Series. Still, they managed to knock off their cross-town rivals (in what would eventually become known as the "Subway Series"), who got even less offensive production with one homer and a miserable .182 average. Back in the World Series after their unexpected absence in 1940, the Yankees were led by Joe DiMaggio, who hit in 56 straight games during the regular season. The Dodgers, meanwhile, reached postseason play for the first time since 1920. The Series opened in Yankee Stadium, and the Bronx Bombers grabbed a 3-2 victory behind Red Ruffing's complete-game pitching and second baseman Joe Gordon's solo homer and RBI single. Game 2 was Brooklyn's turn, with the "Bums" taking a 3-2 decision of their own behind Whitlow Wyatt's complete game. After a day off, the Series shifted to Broolyn's Ebbets Field, but the one-run escapades continued. Game 3 was scoreless until the eighth, when DiMaggio and Charlie Keller each drove RBI singles to center field. The Dodgers scored once in the bottom of the inning, but that's all they could manage against Yankees starter Marius Russo, who went the distance for the 2-1 decision. Game 4 is the one that people still remember. Thanks to Pete Reiser's two-run homer and pinch-hitter Jimmy Wasdell's two-run double, the Dodgers clung to a 4-3 lead after eight innings. After relief pitcher Hugh Casey retired the first two Yankees in the ninth, the Dodgers were just one out away from evening the Series at two games apiece. Casey then struck out Tommy Henrich ... but the ball got by catcher Mickey Owen (who was charged with a passed ball), and Henrich scampered to first base. That opened the floodgates, as Charlie Keller and Joe Gordon eventually rapped two-run doubles, propelling the Yankees to an improbable 7-4 victory. So close to defeat in Game 4, the Bronx Bombers closed out the Series in Game 5. In the second inning, the Yankees scored twice on a wild pitch and Joe Gordon's RBI single, and that was all starter Ernie Bonham would need. Bonham went all the way, allowing just four hits on his way to a 3-1, Series-clinching win.